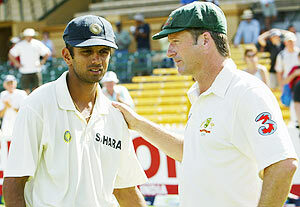 Rahul Dravid has revealed that former Australian Captain, Steve Waugh, was his role model during his illustrious career. Dravid, who recently announced his retirement from international cricket, spoke at a function organised by the Karnataka State Cricket Association in honour of his servitude to Indian cricket, and said that he used to copy Waugh’s mannerisms in order to get into the right frame of mind. Waugh, was never really known for his arsenal of strokes like other classic batsmen, such as, Sachin Tendulkar and Brian Lara. But, he was a gutsy player that would stand tall and defend his wicket to the death, which is why Dravid, who will forever be known as ‘The Wall’, felt that the two had a connection with each other. Dravid will also be honoured by the Board of Control for Cricket in India (BCCI) next Tuesday in Mumbai, which will be attended by past and present Indian cricketers, Dravid’s family and former office-bearers of the BCCI. This entry was posted in Uncategorized and tagged Board of Control for Cricket in India, cricket, India, Karnataka State Cricket Association, Rahul Dravid, retirement, Steve Waugh. Bookmark the permalink.